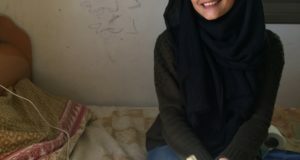 At 4.30 am on Wednesday the 30th of April; a group of Israeli soldiers broke into a family home in the village of Awarta, near the illegal settlement of Itamar. 11 soldiers woke up the family, claiming that it was “security search”. A member of the family asked to see a written order and was shown a piece of paper, written only in Hebrew. Once inside the house, the soldiers forced the family into the living room, confiscating their mobile phones. Muhammad Sharab, a member of the family, stated they were held for 12 hours. No one in the house was allowed to exit to go to work or to school, there are six children and the family, all under the age of 14. During the 12 hours, the Israeli soldiers slept in the house’s bedrooms and used the shower. “I’m just following orders,” was the reply from a soldier. 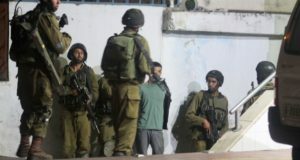 At approximately 5 pm, nearly 12 hours after they entered the house, the Israeli soldiers left the home and the village of Awarta. Reports from the village reveal that the same night Israeli soldiers raided another house. That house is located in the same area where just under two weeks ago Israeli soldiers entered houses in Awarta and shot several tear gas grenades inside. 20 Palestinians, including children, were taken to the hospital due to large amounts of tear gas inhalation. 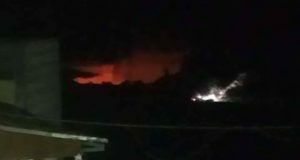 The village of Awarta has been increasingly targeted by the Israeli military, possibly due to close proximity of the illegal Itamar settlement. In the last two weeks, a new road from the settlement, connecting to the main road has been built, and the villagers report that many olives tree were cut down during the construction.